I promised a skincare hangover kit, but it seems like weekend will be the perfect time to provide you with that. So hold on for just a day. Here are my three simple essentials to keep your body relaxed and glowing through the holiday chaos. Exfoliate: I usually use a creamy exfoliator, so I can avoid any harsh rashes on my skin. I love the boots Brazil Nut Body Scrub, smells incredibly like hazelnuts and an absolute joy to use. I just use my shower jell and follow up with the exfoliator. Like the face, cleaning your body is also a three step process, cleanse – exfoliate – moisturise. A DIY alternative to this is a sugar scrub made with equal quantities of sugar, olive oil and vanilla extract (optional)! And if you do use the DIY alternative, feel free to skip my next steps as olive oil will condition and moisturise your skin equally. Condition: Lush’s Ro’s Argan Body Conditioner is a one-of-a-kind product! I just love this so much. It smells like roses and just makes your skin feel pampered. This is intensely conditioning. Being a shower product, this definitely penetrates through your pores and leaves your skin feeling soft, inside out. 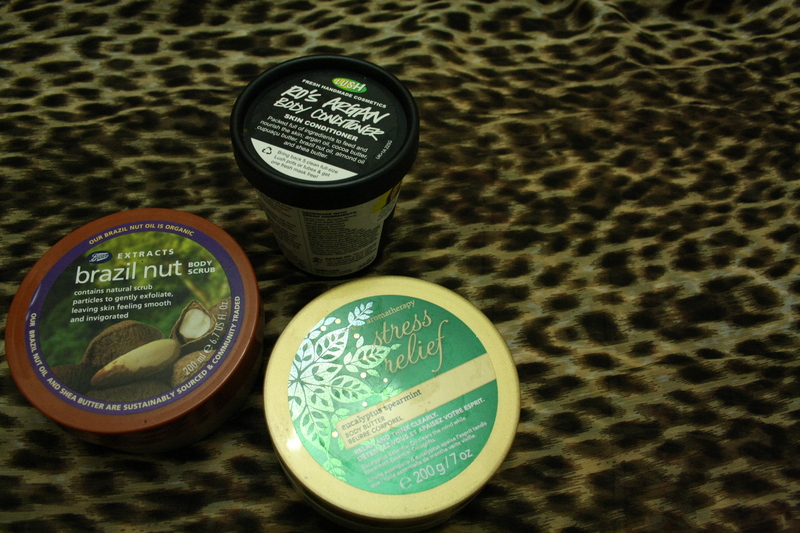 Moisturise: Since it’s the winter season and I am feeling really dry, I do go back with a final body butter. This one is a current favourite. I’ve been religiously using this for 3 weeks and have only seen good results. This particular scent is dedicated to stress relieving and yes, when I do apply this at night, it is soothing. I would recommend this very much! Pro Tip: Because it’s the holidays, I usually also keep a glow lotion or a shine spray at hand. You can find them at Soap & Glory and Bath & Body Works respectively. If you love sparkling as much as I do, you will love this tip too! Let me know what your favourite ways to keep your skin soft and glowing are.